Add baby greens in a large bowl. Add 1 whole carrot, sliced matchstick thin, ½ of a package of sliced grape tomatoes and 1 small sliced red onion. 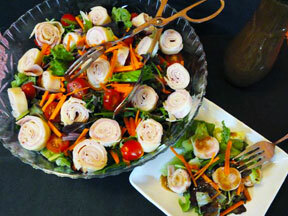 Layer slices of Swiss cheese, ham and chicken breast and roll from bottom to make a pinwheel. Repeat with the remaining deli meat and cheese. Add the pinwheels to salad. Add ¼ cup of orange juice, 2 tablespoons balsamic vinegar, 1 tablespoon Dijon mustard, ¼ cup olive oil, 2 tablespoons honey, ¼ teaspoon ground ginger, ¼ teaspoon salt, 1/8 teaspoon fresh cracked pepper in a small bottle with a lid. Cover and shake well until combined. Pour over salad and enjoy! This is the perfect summer meal for those hot summer days.